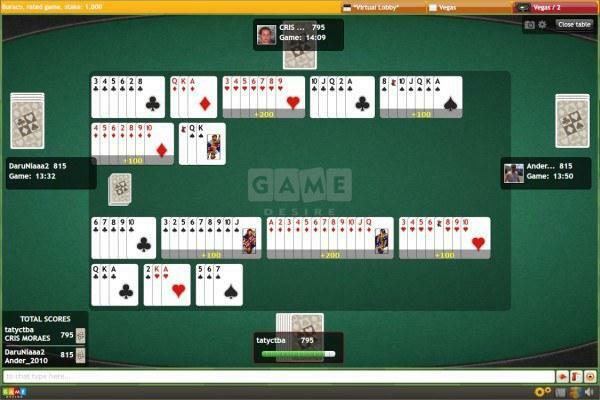 Rummy-type card game, in which you may play in a two-player team head to head with other team. Try this interesting Brasillian variant of Rummy and you will know why it is becoming so popular. If you play card games, you probably know rummy, or at least have heard of it. If not, be sure to check the game rummy 500 at GameDesire! The Brazilian version is not based solely on luck and blind fate, as victory depends largely on well-considered tactics. A more developed version of rummy is buraco. You only need play it once to become a fan! The game of buraco is commonly known as Brazilian rummy, although there are other variants. It’s a fascinating game, gaining popularity worldwide. Instead of wasting time, check out the rules of this entrancing game and try your hand for hours of fun. Buraco is not a complicated game. It may appear difficult, but if you have played rummy before you will pick up the main rules quickly. Depending on the country in which it is played, the rules of buraco may be a little different. Probably the most popular variant is Brazilian rummy, and it is precisely this game that is worth looking into at the start. Two or four people may take part in the game. The game with four people is most interesting, as then it is played by two, two-person teams who compete against each other. The game uses two decks of cards and four jokers, and the object is to gain as many points as possible in each round and discard all of your cards as soon as possible. Each player receives 11 cards. Then, in turn, they take one face down card and discard one card. The next player may take the card discarded by their predecessor and use it to create a sequence. In that case, they will not draw a face down card. Hands are very similar to those in ordinary rummy. But in contrast to the classic game of rummy, in this game you can lay down your cards immediately after creating a sequence. There are also sequences called canastas, which consist of at least seven consecutive cards of the same suit, for example 7 ♥ 8 ♥ 9 ♥ 10 ♥ J ♠ Q ♠ K ♠. In this game sequences count, as only correct ones can be placed on the table, thus helping you to get rid of the cards you hold. It is important to remember the points value of each card, as points gained in this way can prove vital in determining your place. If you are lacking a card to make a sequence, you can use a joker or a two to take its place. Remember that ending the game is only possible if you have placed on the table at least one clean canasta – that is, a sequence of this kind, in which you did not use a joker or a two as replacement cards. Without knowing the values of sequences and cards, you have virtually no chance of winning. If therefore you know the points of individual cards, you have the chance to develop winning tactics in the game. The best sequence is the real canasta. This includes all possible cards and begins and ends with an ace. If you can build this, you will be rewarded with 1000 bonus points. A canasta with all possible cards except the final ace is worth 500 extra points. You will get 200 points for a canasta with at least seven cards, and 100 for a sequence in which a two or joker is used as a replacement card. A sequence such as 3, 4, 5, 6, 7 is worth five points. You get 10 points for 8, 9, 10, J, Q, K. The aces are worth 15 points, jokers 50, and twos are worth 10. If you play the last card, you will receive an additional 100 points. Remember, the sooner you can remember the sequences and values of cards, the sooner you will start winning. 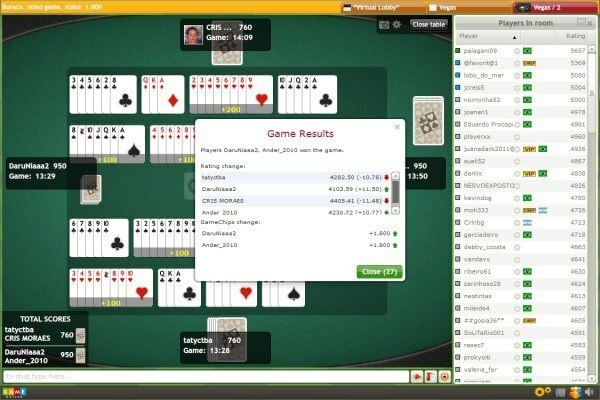 The easiest way to understand the rules of the game is to play several hands online. 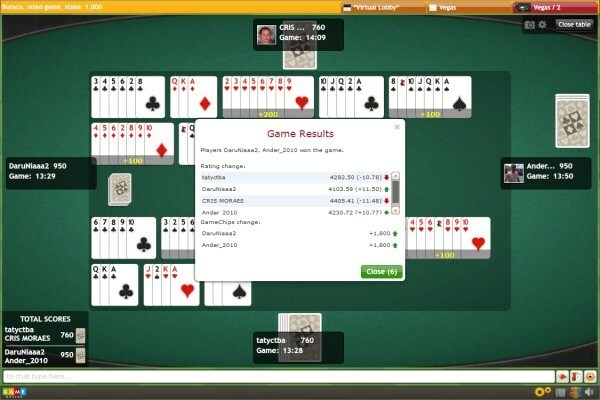 Brazilian rummy online is a great way to avoid boredom. And it is more than just a pastime, as the game helps develop logical thinking and concentration skills. Unlike many other similar games, this one requires not only luck but tactics too. Another advantage is the possibility of team play, which makes online buraco an even more attractive option. At GameDesire you do not play against the computer, but with real people, which is why the game is interesting, exciting and often unpredictable. So delay no longer – go to GameDesire, register free of charge, and enjoy playing the best card games on the internet for free. Play buraco online and the other games available on our website.